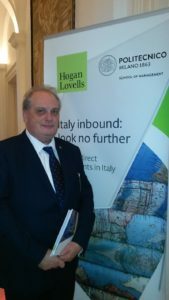 London – Mr. Riccardo Cacelli, CEO and founder of Cacelli & Partners, participated today at the Italian Embassy in London to: “Italy inbound: look no further. Foreign Direct Investment in Italy“. The event organized by Hogan Lovells, one of the largest law firm in the world, was introduced by HE Raffaele Trombetta, Ambassador of Italy to the United Kingdom. The event was characterized by the presentation of M&A italian market realized of Politrcnico di Milano and the subsequent debate. https://www.cacelli.com/wp-content/uploads/2018/04/20180410111627-1.jpg 1422 800 Cacelli & Partners https://www.cacelli.com/wp-content/uploads/2017/12/logocacelli1500-300x122.png Cacelli & Partners2018-04-10 14:59:252018-04-10 15:05:14Cacelli at the "Italy inbound: look no further. Foreign Direct Investment in Italy"